Continuing a weekend of winning, Team USA swept the gold medals in the individual event finals, and took 13 out of 14 possible medals in total. Two-time World all-around champion Simone Biles of World Champions Centre, won three gold medals, one in every final she entered. Lauren Hernandez of MG Elite also won two junior event gold medals, both adding to the all-around and team golds they each won yesterday. In the senior division, Biles won the gold in vault, balance beam and floor exercise. 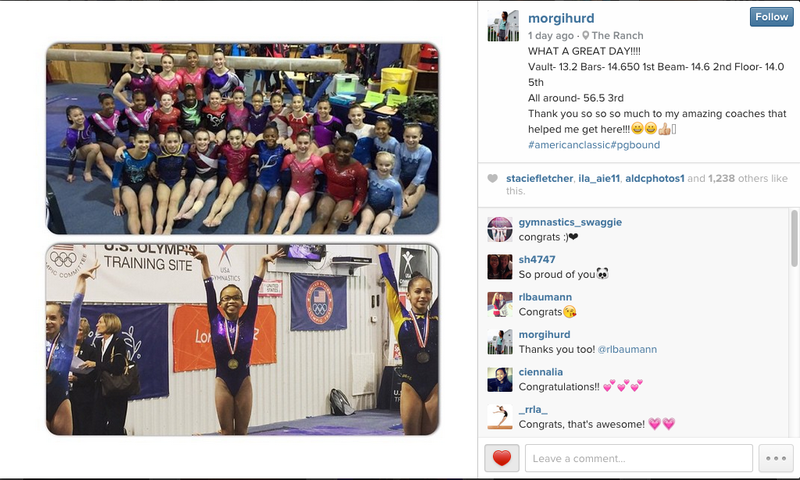 Kyla Ross of Gym-Max Gymnastics won the gold on her signature event, uneven bars. Biles was the only senior US gymnast eligible for the vault finals, but the US went one-two on bars and beam and took the gold and bronze on floor. Marta Karolyi congratulating Simone Biles. Photo by by Filippo Tomasi via USA Gymnastics. Biles took the vault title with a 15.525 (15.9 vault 1; 15.15 vault 2). Arianna Rocca of Italy took second with a 14.500, followed and Elsabeth Black of Canada was third with a 14.2. Simone Biles on vault. Photo by by Filippo Tomasi via USA Gymnastics. Biles withdrew from the bars final, allowing Bailie Key of Texas Dreams to compete. (Since the USA primarily uses Jesolo as a training competition, this is the only meet where they will have a gymnast withdraw from event finals to allow another gymnast to compete.) Ross won the gold with her newly upgraded routine, scoring a 15.25. Key took silver with a 15.100. Sabrina Gill of Canada rounded out the podium with a 14.300. Kyla Ross on uneven bars. Photo by by Filippo Tomasi via USA Gymnastics. Biles scored a 15.25 to win the beam final. Alyssa Baumann of WOGA Gymnastics took second with a 14.55. Carlotta Ferlito took third, scoring a 14.3. Simone Biles takes beam gold. Photo by by Filippo Tomasi via USA Gymnastics. Biles scored a whopping 16.05 -an astronomical score on floor- to take the floor gold. Erika Fasana of Italy squeaked into second with a 14.9, edging out Aly Raisman of Brestyan’s American Gymnastics, who scored a 14.85 for third. Simone Biles bounds her way to floor gold. Photo by by Filippo Tomasi via USA Gymnastics. In the junior division, Hernandez won the bars and floor golds. 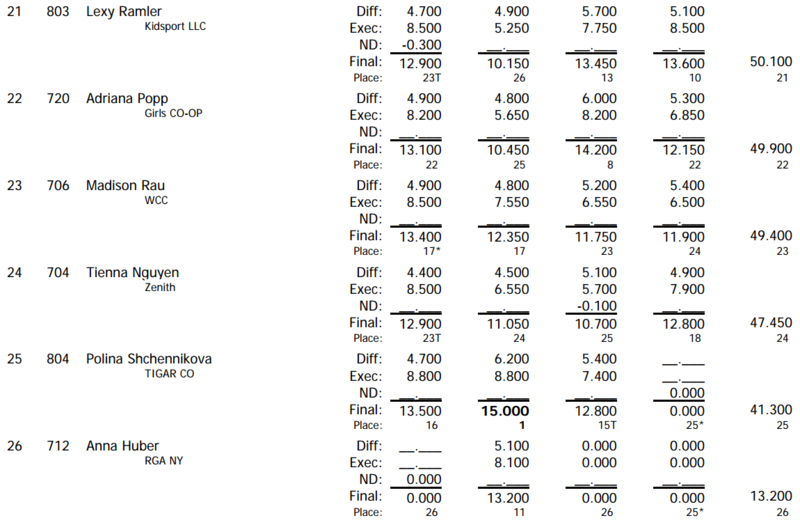 Jazmyn Foberg of MG Elite, won the vault, and Norah Flatley of Chow’s Gymnastics and Dance Institute, took beam. The USA juniors also took silver in three finals and bronze in the fourth. Lauren Hernandez. Photo by by Filippo Tomasi via USA Gymnastics. Foberg scored a 14.600 (14.9, 1st vault; 14.3, 2nd vault) to win the vault title, with Shallon Olsen of Canada just behind her with a 14.55 for second. Ragan Smith of Texas Dreams Gymnastics took third with a 14.35. Jazmyn Foberg on vault. Photo by by Filippo Tomasi via USA Gymnastics. The rest of the events saw the USA go one-two. 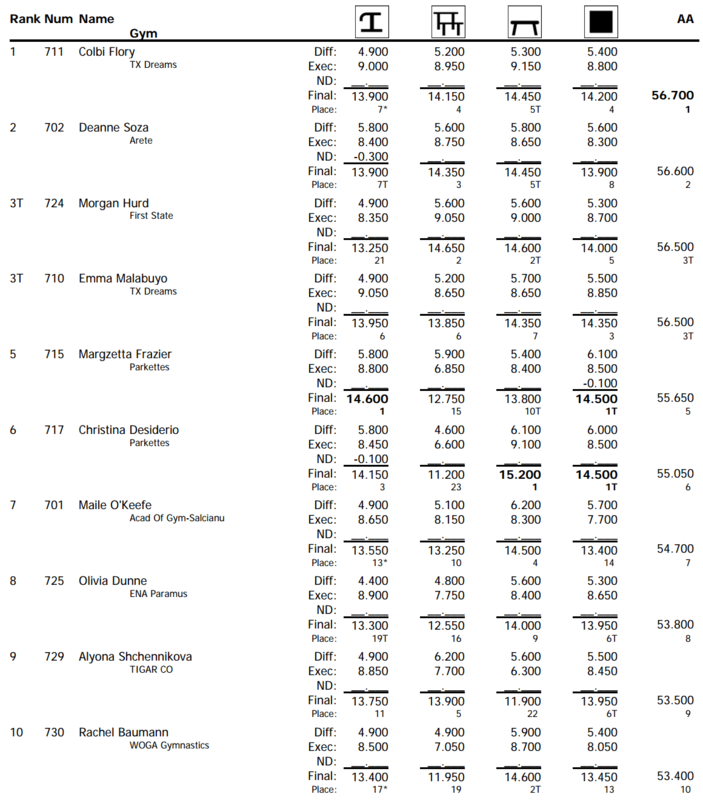 On bars, Hernandez won gold with a 14.5 and Flatley took silver with a 14.25. Rose-Kayling Woo of Canada rounded out the podium with a 4.050. Lauren Hernandez rises to the occasion with her new bar routine. Photo by by Filippo Tomasi via USA Gymnastics. Flatley took top honors on her signature event, scoring a 14.9 on beam. Victoria Nguyen of Chow’s Gymnastics and Dance Institute took the silver with a 14.4. Woo took her second bronze, scoring a 13.75. Norah Flatley impresses on beam. Photo by by Filippo Tomasi via USA Gymnastics. Hernandez brought out a new crowd pleasing floor routine to win the floor gold with a 14.650. Smith scored a 14.250 for silver, and Megane Roberts of Canada took the bronze with a 13.900. Lauren Hernandez performs her heart out for gold on floor. Photo by Filippo Tomasi via USA Gymnastics. Team USA continues their streak of team and all-around dominance on the international stage at this year’s City of Jesolo Trophy meet in Italy. They won the junior and senior team gold medals and swept the all-around podiums. Two-time World all-around champion Simone Biles of World Champions Centre won the senior division, and Lauren Hernandez of MG Elite won the junior all-around title. The first day of competition determined both the team and individual all-around standings and served as qualifications for event finals to be held tomorrow. Team USA totaled 241.3 in the senior team competition, followed by Italy (224.35) and Canada (221.75). The junior competition was held earlier in the day, where the junior team took the gold with a 229.1, followed by Canada for silver (222.45) and Italy rounding out the podium with the bronze (208.15). For the all-around competition, Biles led the seniors with an incredible score of 62.1. Bailie Key of Texas Dreams took the silver in her senior debut with a 59.5, and Aly Raisman of Brestyan’s American Gymnastics totaled a 59.1 for the bronze in her fist competition since the 2012 Olympics. In addition to sweeping the podium, the USA posted the top 5 all-around scores, and with no two per country rule in place, took nine of the top ten spots. Gabrielle Douglas of Buckeye Gymnastics came in fourth in her first competition since the Olympics with a 58.9, and Alyssa Baumann of WOGA Gymnastics took fifth, posting a 58.7. Erika Fasana of Italy took sixth (57.55), and seventh through tenth went back to the USA. The order was Maggie Nichols of Twin City Twisters (57.5), Megan Skaggs of Gymnastics Academy of Atlanta, (57.15), Madison Desch of Great American Gymnastics Express, (56.9), and Kyla Ross of Gym-Max Gymnastics (56.75). Emily Schild of Everest Gymnastics made her international debut and scored a 54.95. 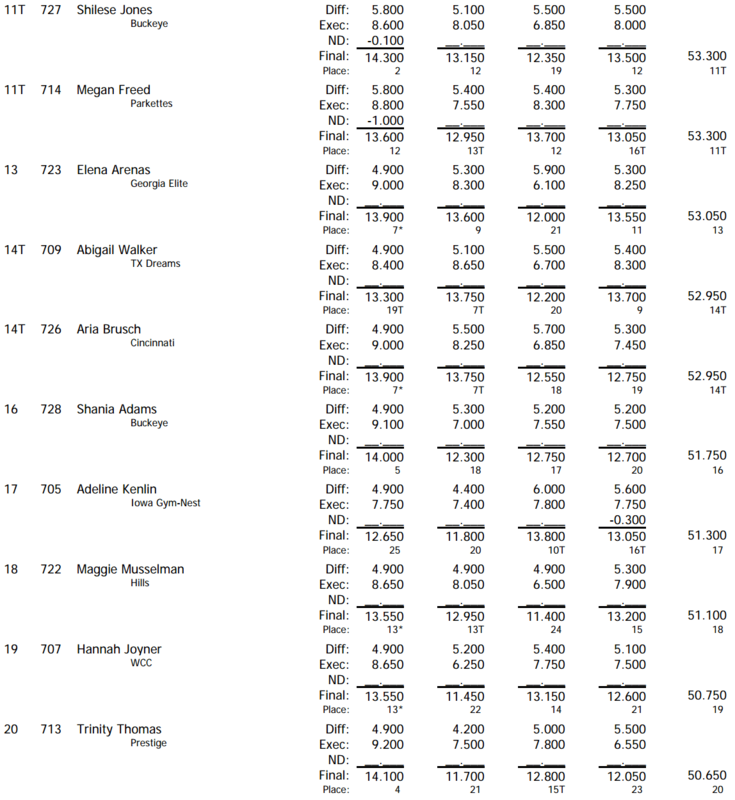 All of USA’s juniors finished in the top ten in the all-around in addition to sweeping the podium. Hernandez posted a 57.65 for gold followed by Norah Flatley of Chow’s Gymnastics and Dance Institute with a 57.45 for silver and reigning National junior champion Jazmyn Foberg of MG Elite with a 56.55 for bronze. 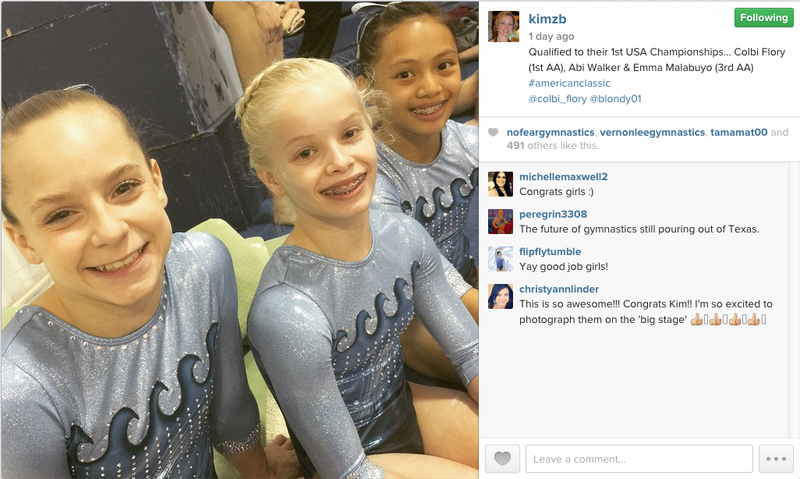 Ragan Smith of Texas Dreams Gymnastics was fifth (56.1) and Olivia Trautman of Twin City Twisters took sixth (55.2). Victoria Nguyen of Chow’s Gymnastics and Dance Institute finished ninth (54.5). Both junior and senior event finals will be held tomorrow. 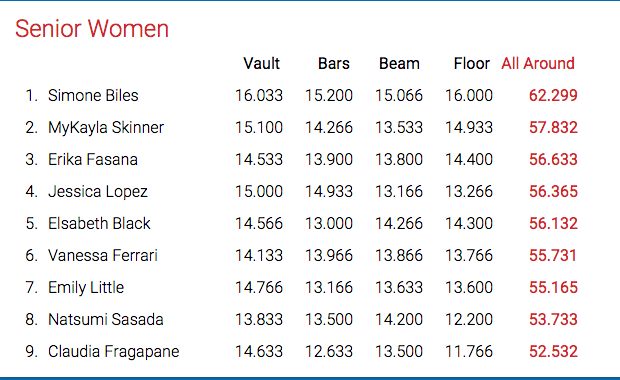 In the senior ranks, Biles qualified to all four event finals in first, and Ross will join her in the bars final, Baumann in the beam final and Raisman in the floor. In the junior division, the qualifiers were Smith and Foberg on vault, Hernandez and Flatley on bars, Flatley and Nguyen on beam, and Hernandez and Flatley on floor. This weekend boasts one of the most exciting meets of the spring, as it gives us a first look at many of the US gymnasts. 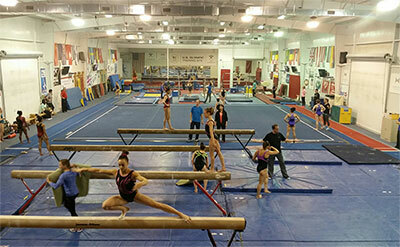 The City of Jesolo Trophy will be held March 25–29, with team, all-around and event finals taking place on the 28-29. USA Gymnastics takes quite a large team to this meet, giving many gymnasts a chance to debut for the year as well as gain international experience. The senior squad includes 2013-14 World all-around champion Simone Biles, and 2012 Olympic team gold-medalists Gabrielle Douglas, Alexandra Raisman, and Kyla Ross. Junior 2013 Junior National Champion Bailie Key will make her senior debut. The competition highlights competitions in both the junior and senior levels, in the team, all-around and individual event categories. As the defending Jesolo champions, the United States automatically qualify to the team and all-around finals, as does the host country, Italy on March 28. The other countries will participate in qualifying rounds March 25-27. The March 28 competition will determine the team and all-around results in both the junior and senior divisions, and the top eight athletes, with a maximum of two per team, will advance to the event finals on March 29. The competition schedule is: March 25, junior team qualification; March 26, senior team qualification; March 28, junior and senior team and all-around finals; and March 29, individual event finals. The Italian Gymnastics Federation will broadcast a livestream of the competition on its YouTube Channel,www.youtube.com/user/FGIfederginnastica. The complete U.S. Team roster is included below. *Schild and Skaggs have been added to the senior national squad, with Trautman named to the junior team.